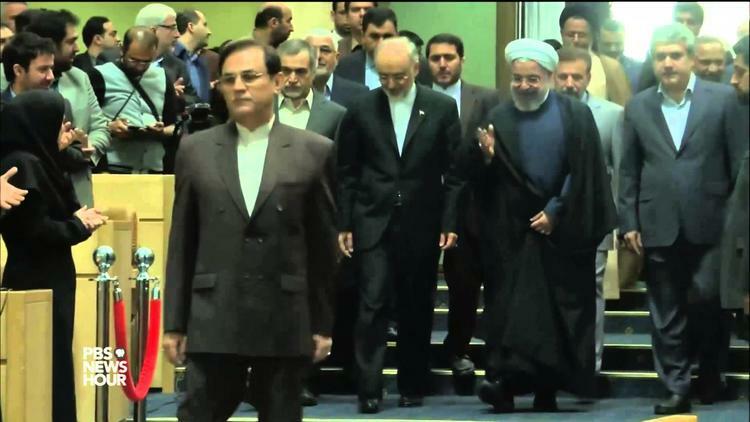 Iran: What did Khamenei really say about the Lausanne Agreement, and Why? Ayatollah Khamenei, Iran’s paramount leader, spoke out on Thursday about the framework agreement for Iran’s negotiations over its nuclear enrichment program with the five permanent members of the UN Security Council plus Germany (P5 + 1). The speech is all over the place and seems to me to involve a lot of posturing without much substance. Presumably the speech was intended to mollify the hard liners upset by the enormous concessions Iran was alleged to have offered. At the same time, Khamenei did not want to crush the spirits of his negotiators. And, I think he is still pessimistic about the very possibility of a final deal by June 30 and is preparing the public for the possibility of failure. Khamenei pointed out that there is as yet no detailed agreement. All that was arrived at in Lausanne was a framework agreement for the final negotiations. Therefore, nothing has really been decided. Khamenei said that people asked him to take a position on the nuclear talks. He replied that there is, as yet, nothing to take a position on. But he then came back to say that he has full confidence in the Iranian negotiating team led by foreign minister Mohammad Javad Zarif, who reports to President Hasan Rouhani. He does not, he affirmed, have the slightest hesitation in their regard. He is supportive of the negotiating process. It is just, he said, that the Americans have proven themselves over and over again to be snakes in the grass, duplicitous, deceiving, untrustworthy. Based on their past behavior, he said, he has to be pessimistic about the possibility of doing a deal with the USA, since there is a real danger it will renege on everything that is agreed upon. He gave as an example of this American dishonesty the issuance by the White House of several pages of talking points about the agreement, which, Khamenei said, they issued unilaterally and without consultation with the Iranian side. Khamenei didn’t seem actually to take issue with any particular in the talking points. He just felt that to issue them as though they had been agreed on by Iran was dishonest. That said, he is willing to be open-minded. Maybe this time the US has changed its spots and will do a reasonable deal and stand behind it. If the USA behaved that way, Khamenei said, it could change everything. So he is pessimistic, but still open to the possibility that the US will not act with perfidy. He does insist, he said, on sanctions being removed immediately and entirely as soon as an agreement is reached. Otherwise, he said, what was the point of engaging in all these negotiations? Khamenei’s demand for full and immediate end of sanctions is not reasonable, and won’t be offered, since the P5 +1 have trust issues of their own with regard to Iran. But since Khamenei went to such lengths to reassure everyone that he still was committed to the negotiations, he probably did not intend this demand to derail them. One possible reply to him on this matter would be that the agreement is not complete when signed but when implemented. In a sense, the mere signing of the agreement won’t take us very much further ahead than we are now, a situation about which he is so non-comittal. So the first full day of the actual implementation of the agreement’s terms will in fact be the day that sanctions are removed. My guess is that this bluster was intended to mollify the hard liners without actually offering them anything. I think a realignment is happening in Iranian politics. The 2000s were a period of right wing populism under Mahmoud Ahmadinejad. Khamenei had his hands burned by the Ahmadinejad faction of hard line populists. They provoked all that trouble in 2009, and mismanaged the economy with massive subsidies. By 2012 Khamenei was openly slapping Ahmadinejad down. Then the US kicked Iran off the bank exchanges and took Iran oil exports down from 2.5 mn b/d to 1.5 mn b/d. Since prices were high, it didn’t hurt the regime that much, but must have been concerning given what was done to Mosaddegh in 1953, when similar int’l oil sanctions prepared the way for a CIA coup. Khamenei hates the reform camp but seems to have realized that he can’t count on simply being able to crush them. He can, in contrast, live with a centrist like Rouhani. Domestically, Rouhani is his way of deflecting what’s left of the Green Movement (which really shook Khamenei, perhaps even moreso after Mubarak et al were toppled by the Arab youth 18 months later). Internationally, Rouhani holds out the possibility of escaping the severe sanctions but keeping the nuclear energy program, which is Khamenei’s baby and which he sees as a guarantee that Iran can’t be held hostage by the international energy markets and great powers. But deploying Rouhani means slapping down Iranian Revolutionary Guard (IRGC) hard liners, which he did in February. Hard liners are jumping up and down mad about what Rouhani & Zarif are alleged to have given away to the West, and my suspicion is that Khamenei’s demand for immediate end of sanctions is a way of tossing them a bone for the moment. If you read the whole speech he comes back and is still supportive of the process at the end, saying he is not for or against the deal since there really is no deal yet, just a framework agreement for negotiating the deal. But then that means he did not, contrary to the headlines, come out against the deal today. Khamenei is not allying with soft liners. Rather, he is trying to put together a new coalition of centrists and pragmatic hard liners who can sideline both the reformist Greens and the populist far right, in essence transcending and leaving behind the key divisions of 2009. At the same time this new center-right coalition could just possibly do a nuclear deal with the P5 +1 that would turn around Iran’s economy. But this latter may or may not be possible.